2P START! Live! : Wii Where? Edition | 2P START! Listen as we discuss Nintendo’s new Wii Ware and its missed opportunities, the warm reception for our Lego Indiana Jones comic, and the game that finally got Tim’s wife asking to play video games! All this plus our regular segments jam-packed into a half hour podcast! Hey Tim/Ray, are you gonna let me and D3vin put up our guest comic? We are getting closer and closer to finishing it . I’m back. Wow, episode 30 O_O!!! I had to eat fast when I went to go see 300, I got to the restaurant like half an hour before it started(already had my tickets). The trivia really sounds like it’s from a SEGA game. Is it Nights? I don’t really care for Wiiware much at the moment, nothing interesting enough to buy yet. Except for maybe that new Super Soldier, but it’s a tournament version, which turned me off. Wiifit came out on my friend’s birthday(today), he’s pretty overweight. We all think Nintendo’s sending him a message . dj^n, don’t you mean N1T3S?!? I downloaded both Lost Winds and the Crystal Chronicles game, My Life as a King. They’re both really good games, but Lost Winds is rather short. 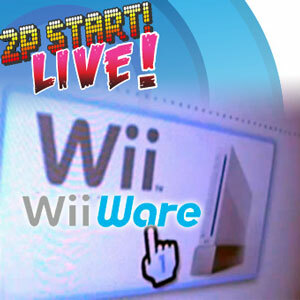 I have a feeling that that game is going to have WiiWare squeals, especially if the first one sells. Sonic R for the trivia for you? Here’s the skinny on the Wiiware space. Lost Winds is 258 blocks, and Defend Your Castle is 121. Pretty high, but not more than the N64 VC games… I can only imagine that the Final Fantasy game is way way up there though. That space’ll get sucked up pretty quick as the games come out, though… Also, I felt the same way about Defend Your Castle (that I could just play it online) but it has some fun multiplayer. When someone else joins in on your game, the difficulty seems to increase, and whoever gets the most points in that round gets to decide how to spend the points at the end. It’ll probably be pretty crazy with four people… Anyway, fun podcast as always! because of all the rain? These podcasts are always nice to have. I have all 30 on my iPod and so far, on 6 different occasions you have had the same comment and on ALL 6 EXCEPT THE FIRST TIME one have you has asked the other. Now its sort of becoming a tradition. That and doing the gag black doom intro. I mean there an albatross character in riders, so no you should never run out of those. Because once you finally get through all the characters in all the sonic games. They will release Unleashed and give you 10+ more characters to rip on. The “Trivia for you” is from Metropolis Street Racer. Great podcast again you guys! You really help me out on my ways to and from work. That sounds like it’s from Katamari Damacy, but I’ve downloaded the soundtrack, so I know it’s not. Black n white is probably right. Hey Ray: Having issues with the SD card transfer speed limit? Yeah, that’s the issue with the technology used with the SD card and its physical connectors. Sure, its pushing 10-20 megabtyes per second for transfer rate (a rough estimate obviously) but its still limited. Yay for everchanging technology. It would be nice if the data was moved instead of copied.. its annoying to go about doing that over and over (I’m used to doing cumulative backups of all my work weekly [and sometimes daily on those good days] so I feel your pain about waiting for copying).. That’s more of a software issue instead of hardware. At the very least, a queue should be used so that files can be set to copy over and you can walk away while it does the heavy lifting. Revisions would be nice in that department. 2P start is the no. 1 web comic if you don’t achewood. Defend Your Castle is extremely fun with four players. I can play with my 7 year old brother and my family has a great time. New formula for a game comic. Don’t make it obvious that it is about video games. Also, by waiting a week to listen to the podcast, you guys sound completely uninformed about Wii Fit. Since we moved, my wife is (temporarily) unemployed, and she just sits around beating my times/scores in whatever game she can find. Its funny how Tim call’s her ‘Sara’ in the first podcasts. Then, during the last few he says ‘The Wife’….